Ready to register? Clich here! 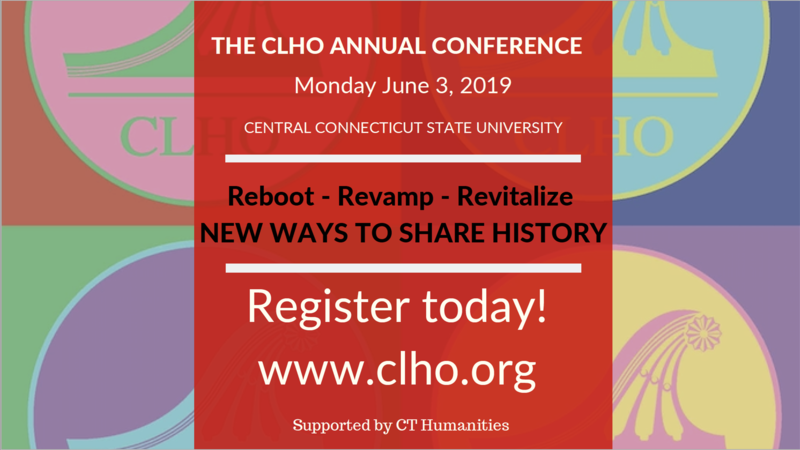 Since 1950, CLHO has strengthened and sustained members by sharing knowledge and experience, and promoting best practices among museums, historical societies and all who steward Connecticut's heritage collections. Are you interested in helping out at CLHO? Fill out this short answer form to learn more about our TAGs (Task Achievement Groups) and how you can take part in many of CLHO's different initiatives. Thank you! interpret, and share Connecticut's multi-cultural story. Yes! I want to make a tax-deductible gift to support the work of the CLHO. 2019 Awards of Merit Sponsors! Stay tuned for our 2019 Annual Conference Sponsor list!